A bottle of wine that smells “off” has long been the aficionado’s dread and the industry’s curse, but Washington State University’s Victoria Paup, a Ph.D. student in the School of Food Science, is using game-changing technology that could help detect and potentially stop the cause of a wine’s malodor before a bad batch reaches the market. 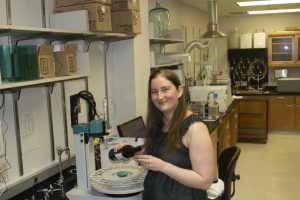 As part of her doctoral research, Paup studies “wine faults”—off-aromas or flavors caused by a range of factors like oxidation, reduction, or chemical imbalance. While some of these faults are easier to detect and fix, others remain elusive and challenging. But thanks to Paup’s research and a highly sensitive machine called the electronic tongue, winemakers may be able to stop the bacteria causing these faults, saving the industry and consumers both time and money. Ph.D. student Victoria Paup tests for wine faults using the electronic tongue. “The implications of our research could be huge,” Paup said. Her goal is to see if the “e-tongue’s” sensors can reliably identify previously undetectable microbial changes in a wine’s chemistry before it is too late. The key, she said, is determining “how accurate and how early” the e-tongue can be in its detection of spoilage microorganisms. “These spoilage bacteria can develop in the bottle when the wines are supposed to be stable and finished.” And that, she noted, can be costly. This study was supported by the Washington wine industry. To learn more, visit WSU’s Viticulture & Enology program.